For the 20th anniversary of “Buffy the Vampire Slayer,” poems from a collection by Lisa Cheby, inspired by the cult-popular TV show, explore grief, power, love and more. 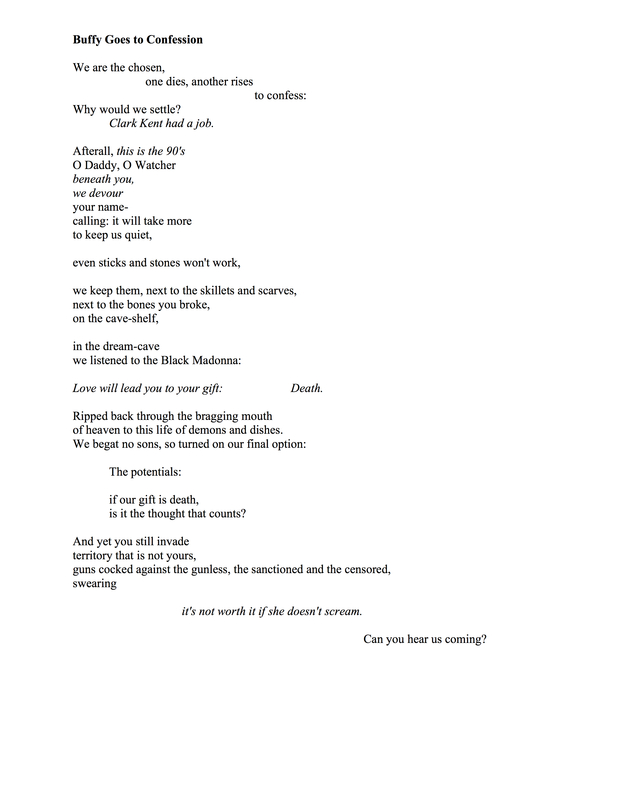 Click on each poem for a larger view. 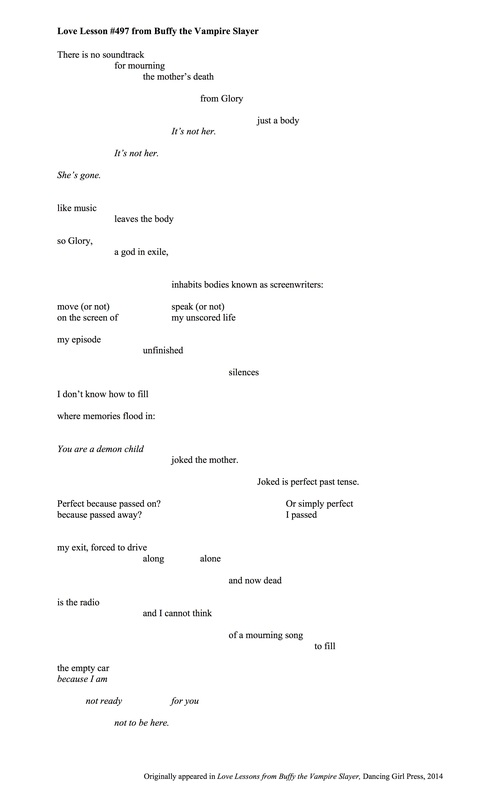 Lisa Cheby’s poems, reviews, and essays have appeared in various journals including The Rumpus, The Citron Review, Tidal Basin Review, A cappella Zoo and TAB: Journal of Poetry and Poetics, which nominated her poem for a 2015 Pushcart Prize. Lisa’s poems are also found in the anthologies “Drawn to Marvel,” “The Burden of Light” and “Coiled Serpent.” Her first book, “Love Lessons from Buffy the Vampire Slayer,” is available from Dancing Girl Press and was featured in The Wardrobe’s Best Dressed Series. Lisa holds an MFA from Antioch and an MLIS from SJSU. Learn more about Lisa at her website. 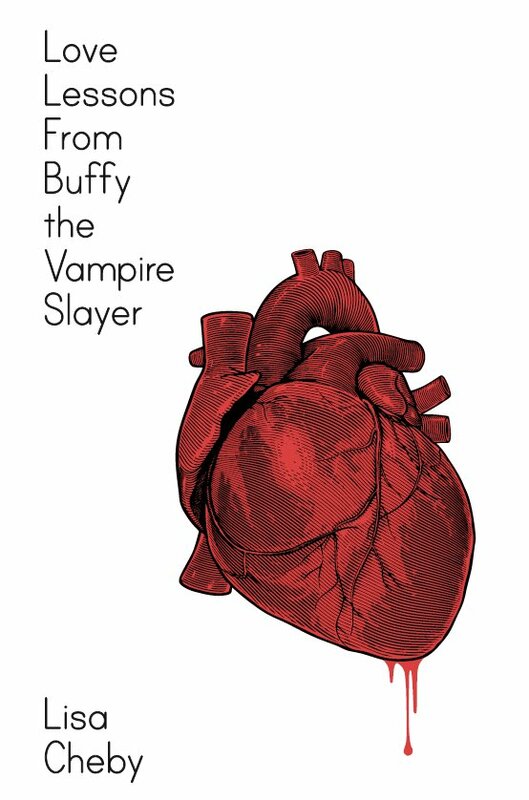 “Love Lessons From Buffy the Vampire Slayer” cover artwork created by Jason Adam.